ALLEGRA BOVERMAN/Staff photo. Gloucester Daily Times. Gloucester: At the ribbon cutting for the new Base Gloucester fish auction mart at Fisherman's Wharf on Wednesday. 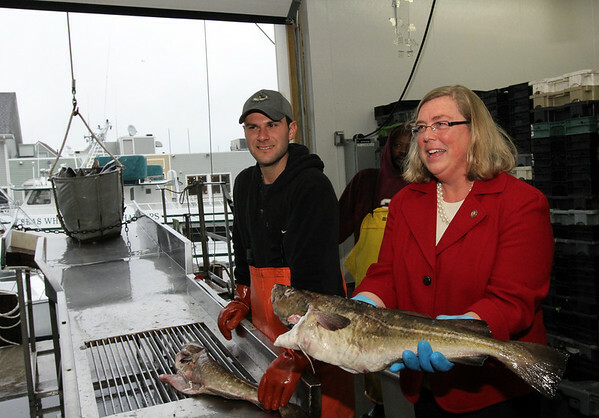 Gloucester Mayor Carolyn Kirk holds a cod that was part of the first landings of fish at the Fisherman's Wharf by local fishermen on Wednesday. The S.S. Melon II was the first boat in after the ribbon cutting, and brought mostly pollack. Next to Kirk is Joe Ventimiglia.